CLAT Exam 2018 is your gateway to all 19 national law schools in the country. Are you going to appear for CLAT 2018?? If yes, then you can't even think to say no to CLAT Mock Tests. If you are wondering why, what would be the loss without Mock tests, then read the post and find it out yourself. Experts observe that candidates who choose to appear for CLAT Mock Tests are significantly better off vis-à-vis those who find it merely ritualistic. Remember, mock tests offer an amazingly wide variety of questions. With the same level of preparation, you will definitely gain an edge for 10+ marks with Mock Tests. Because, it will help in improving speed as well as accuracy. Analysis becomes mandatory after every test; it is the cornerstone. Mock test loses its edge if there is no analysis. Increasing the number of mock tests gradually is one steady way of acquiring greater confidence. 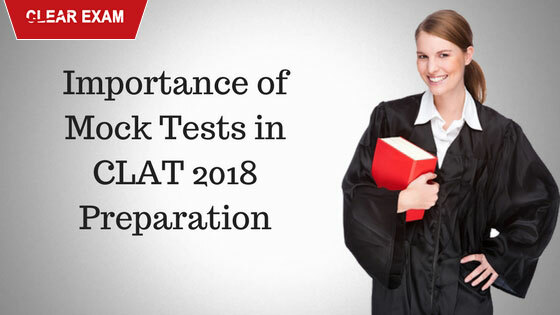 From five in December to ten in April, this gradual increase in the number of CLAT 2018 Mock Tests brings candidates closer to the target. When you are preparing for CLAT Exam an important strategy is sitting for many a CLAT mock test. There are two kinds of mocks. One is a manual mock, and the other is a CLAT mock test online. When you are appearing for an online mock then your ability to use the mouse becomes important, and in case of manual mock sit with an OMR sheet. Then again there is something called sectional mocks. In a sectional mock you will be asked questions only from the section which you choose. This comes handy when for instance you are studying Maths for one whole week. What you can do at the end of the week is to appear for the sectional mock on Maths. You will find sectional mocks for every subject. There is a method to using mocks to your advantage and appearing for mocks. Initially when you have just started preparation you could take around 5 mocks, and later towards the end your mock number should go upto 20 mocks per week. 1) It gives you an edge over those who have not sat for mocks. 2) You may find some important questions in the mock which may also appear in the exam. 3) Your time management skills improve. From spending 40 seconds on a question you go down to spending 25 seconds per question. This translates into how much time you devote to every section for example 15 minutes for English, and 13 minutes on Maths. This is a very important trick which can be mastered with the help of mocks. 4) Mock Test will increase your speed. The questions in the CLAT Exam are specifically meant to test your speed and accuracy. Your accuracy improves with the practice of Mock Tests. You will reduce the chances of negative marking by 10%. 5) At times you get to know your exact AIR ranks, and ranks wrt your peers, and this also reflects on how well you are doing. When the mocks are being checked then SWOT analysis takes place. SWOT is an acronym for strength weakness opportunity threat. This is an in depth analysis of one's performance. 6) Also while you are taking a lot of mocks what happens is that you end of developing methods and means to quickly and accurately answer questions. This trick development helps in the real exam. 7) Mocks are designed on the curriculum of the actual exam, and follows the paper pattern so you get a real picture of how the exam would be like. The marking scheme is also the same as that in the real CLAT exam. 8) When you appear for these mocks with the same exam pattern, syllabus and toughness level as the real exam then slowly and gradually the exam pressure starts to ease off. 9) Some tests are based on past year papers, and if not then in addition to mocks you should also crack past year papers of 5-10 years as many times the questions are picked from the past year papers as it is. 10) You can make use of free online mock test for CLAT and your performance improves for free and without any cost. All this combined increases your confidence which is extremely important. When you are sure that the exam can be cracked then half the job is done already. If you are wondering where you can find these mocks then it is super simple. There are very many coaching institutes that have their test series' for CLAT. This series includes tests with entire syllabus covered, sectional tests, and speed tests. That is not all because in addition to this there are topic tests. Study a particular topic, and immediately follow that up with a topic test. Nothing like this method to gain expertise on a particular topic. Clat Mock Test based on actual exam pattern. examination of Common Law Admission Test, for CLAT GK, Legal Aptitude, English ,CLAT Logical Reasoning, Mathematics.